Whether you decide to start your baby on cereal and purees, or follow a baby-led weaning approach like I did with my daughter, starting solids is a huge and exciting milestone. I couldn’t wait for her to hit the 6-month mark so I could welcome her to the wide world of food — but I was soon very surprised to learn just how strong willed she was when it came to what went into her mouth. A year and a half later, she’s still fiercely independent, but she does eat plenty of healthful foods, including kale chips, roasted beets, raw green beans, every kind of melon, and plums. Sure, we still get stuck in a food rut now and then, but there are a few simple reminders that I turn to for perspective. 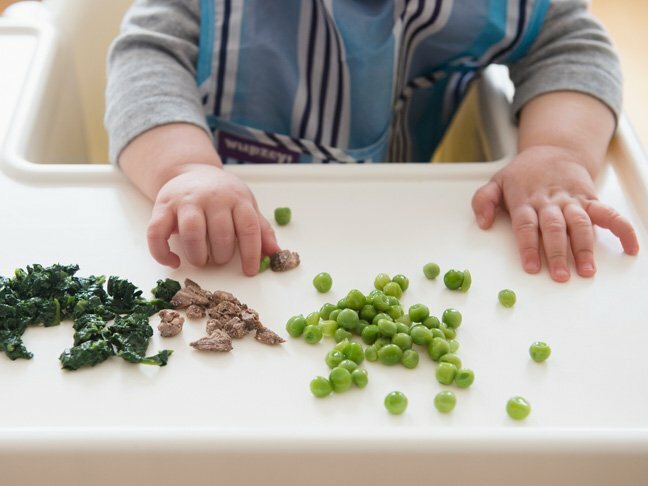 So if you’re like me and find yourself stressing about what’s making it into your child’s tummy—and how much good food is landing on the floor and the high chair — I hope that these simple tips will help. 1. Eat a variety of the good stuff yourself. You can be certain that your child will model your behavior in more ways than you can possibly expect—and often when you least expect it. I never thought that my daughter would love beets or kale chips as much as she does, or that she’d enjoy munching on raw green beans as much as I do. I’ve found that the more she’s seen us enjoying a range of produce at the table, the more likely she is to try things for herself. Here’s an easy rule that I try to follow: Buy one thing from the produce department each week that you didn’t the week before. I usually look to what’s on sale to help me make this resolution stick. 2. Make sure that the food tastes good! This one sounds so basic, but it can be an easy thing to forget when you and your baby aren’t always eating the same thing. So if you aren’t in the habit of regularly tasting the food that you serve to your baby, you should really start—it’s the only way to know if it’s yummy (or not). Once I started to taste the baby food I made before I fed it to my daughter, I realized that I needed to make things more flavorful. My girl liked a little fresh mint or parsley with peas and green beans, butter with carrots, cinnamon with pears or apples, and a little Parmesan with broccoli. 3. Pair new foods with one she already likes. When my daughter was a baby, I would mix pureed butternut squash, broccoli, or zucchini with pastina, her favorite food, to ensure that she was getting some vitamins with her carbohydrates. It’s also easy to add shredded spinach or diced carrots to scrambled eggs, kale and berries to smoothies, or mashed sweet potato with rice cereal. Another way to think about this: Once you know your child likes a certain food, change up how you prepare it just slightly so that it’s still familiar, but she hopefully won’t get locked into eating it just one specific way. 4. Talk about food. Your baby may not be talking yet, but that doesn’t mean that she’s not very aware of the world around her. Talk about the food you are serving, paying attention to the textures and colors. This will help baby to both learn about food and to learn new words. I carried my infant in my Ergo at the grocery store and farmers market so that she could look at the brightly colored produce and see new faces. I’d talk to her about what I was shopping for as we went, and now that she’s a toddler, I chase after her and her little shopping cart as she hurries to stock up on her favorites—bananas, plums, peaches, and cucumbers. 5. Be creative with presentation. You don’t have to sculpt nature scenes, a circus, or a boat to make meal time interesting for your tot. I like to arrange berries into a smiley face on top of oatmeal, make an “L” with fruit puree on top of my girl’s yogurt, or simply move snack time onto the porch or into the yard for a change of scenery. These simple efforts have helped me to keep my child engaged with what she’s eating (even when it might be leftovers!). 7. Don’t push too hard. You may find that the harder you push your child to eat something, the harder he’ll push back, so it’s a good idea to relax a little….at least that is the way that it works with my independent child. I try to offer a range of healthy foods throughout the week and then let my daughter decide what to put into — or spit out of — her mouth. So if your baby isn’t interested in the butternut squash puree or avocado mash today, let that be okay and try again tomorrow. It’s taken me a while to learn that she’s not judging my cooking by refusing something I’ve given her — she’s just being a kid and learning to express herself. Even if she happens to be making a mess at the same time.